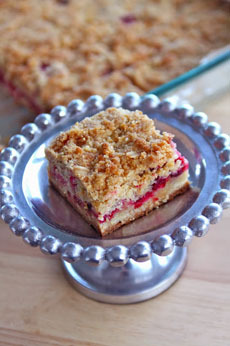 For a simple dessert or coffee break snack during the holiday season, try these “crantastic” crumb bars from the talented Lauryn Cohen, a.k.a. Bella Baker. See more of her terrific recipes at BellaBaker.com. Try these crumb bars with a morning cup of coffee or as a snack. Photo courtesy Bella Baker. 1. PREHEAT the oven to 375°F. Line a 9×13 glass baking dish with aluminum foil and spray foil with nonstick spray. 2. MIX together in a bowl 1-3/4 cups sugar, the oats, flour, almond meal, salt, cinnamon and baking powder. Use your fingertips or a pastry cutter to blend in the butter. With a fork, mix in the eggs to create a dough that comes together. The dough will be a little crumbly. Pat half of the dough into the buttered pan. 3. STIR together in another bowl the second 1-3/4 cups sugar, potato starch, vanilla and orange juice. Mix in the cranberries. Pour the cranberry mixture evenly over the dough in the pan. 4. CRUMBLE the remaining dough over the berries and gently pat down so that dough is covering all of the cranberries. Bake for 50-55 minutes, or until the top is a light golden brown. 5. COOL completely and chill in the refrigerator before cutting into squares. Store in an airtight container in the refrigerator.